I was part of the Enamelist Gallery at the ART Center, the Torpedo Factory in historic downtown Alexandria, Virginia. I would often go to the other galleries and art studios. One day I was at the stained glass studio and on the wall—in handwriting—on a sheet of paper I read: P194-195-196…BLACK ELK…Black Elk speaks… I don’t know why, but my eyes were filled with tears. I asked the owner of the studio where this came from. She said, “The BOOK, Black Elk Speaks, and maybe the bookstore down the street would have it.” They did. I came home and read the whole book and became an admirer of Black Elk. Of course it helped that Black Elk was a Heyoka: a Native American Sacred Clown. I had become a student of Native American Spirituality in 1990 because my daughter married a part Native American man. They were married in the Chapel of Keterie Techawitha on the Warm Springs Reservation in Oregon. This reservation now has a Smithsonian Indian Museum on it. In June (before the wedding) my daughter and I attended the sacred ceremony of ground breaking and planting of a time capsule into the earth. The ceremony was all in sacred circles with the East Gate left open for the Great Spirit to come in. It lasted for hours and was very moving. In Black Elk Speaks, Black Elk tells of his vision that he had at 6 years of age. He had waited for a man to come who would write it down and make it available to us. Black Elk was a very old man—in his 90’s—when Neihart came to record it. This picture is of the Joy in his VISION of the Sacred Hoop being mended. 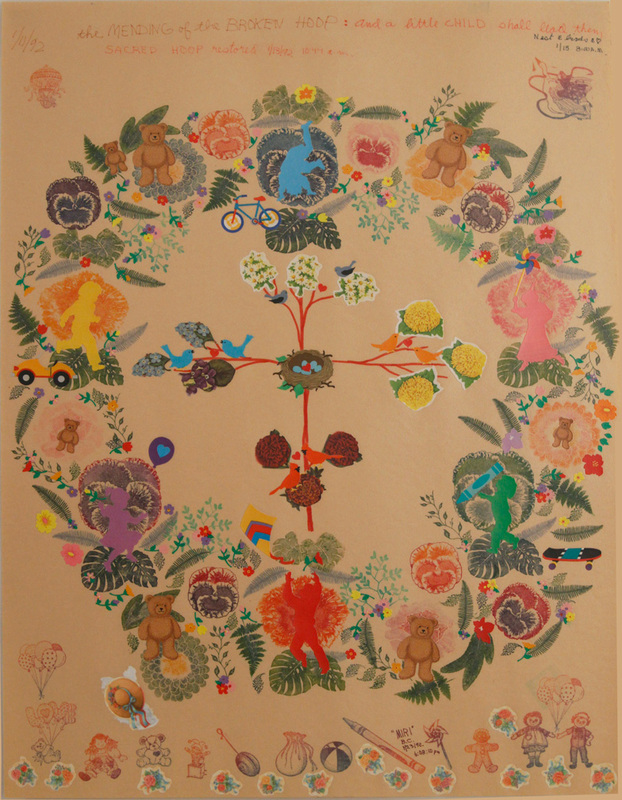 The Hoop has children tumbling and playing with toys and flowers in every direction—North, South, East and West. In the center is the red stick Black Elk threw and it began to bud. It grew leafy branches and birds came and built a nest in the center of the tree. In my pictures, I create a positive and joyous experience of an event or situation that needs prayer. I could say that these are my inner child, Miri’s, prayers. I did the rubber stamping, placed the stickers and drew with my left hand, thus by-passing my serious adult-thinking mind. This is my version of Black Elk’s vision of the Mending of the Sacred Hoop of LIFE.